Almost every guy we know has a polo shirt (or seven) in his warm weather wardrobe. They’re a summertime smart casual staple with no plans of going anywhere, anytime soon. The good news, there’s more styles than ever, and just as many ways to wear them. As for these guys knowing how to wear a polo shirt in lots of different ways? Ah, not so much. We’ve seen too many “same ol’ same ol'” outfits that we figured it was time for a primer on how to wear every polo shirt in your closet, in a few different ways. First up? The bright polo. For a classic summer look, a bright pique polo is the obvious frontrunner, and you can’t go wrong with the original. A bright red polo is a good option all summer long, and even transitions perfectly into autumn’s changing leaves scenery. Wear it well: Make sure your attitude is just as refined yet relaxed as this look. In colder weather (and a heavier suit), opt for a knit polo instead of cotton for a Mad Men vibe that feels like a soft tee but looks much more luxe. Much like absolutely everything involved with suiting – fit is paramount. To avoid looking sloppy, make sure your polo fits your frame without being skin tight. Wear it well: Skip a belt, set your watch to the time at your destination and store your flight must-haves in this bag. Wear it well: Cuff the jeans and watch out for hat hair. Wear it well: Skip the socks and keep your jacket unzipped. What about if you’re a less flashy guy that still wants to stand out? How about a subtle contrast tip collar? Blending the formality of a collar with the comfort of a tee, the polo remains a sportswear classic. The contrast-tip style polo’s rise to popularity began in the 1950’s. While the original polo was de rigueur on the tennis court and golf course, the contrast tip polo was adopted by young men of the time simply as a style staple. If they were already transitioning this athleisure style from the sports court to the streets way back then, you can bet it’s still a worthy investment now. For the most versatility, opt for one in a cotton piqué, like the style below. A piqué polo with a contrast tip is the perfect, classic way to infuse athleisure into your daily wear. Wear it well: Keep it neutral for the office, but pair it with a pop color bag. And tuck it in! Wear it well: Keep the polo untucked and roll up the chinos to show off fun kicks. Wear it well: Take all the best styles of the 50’s and put the together. Make sure to tuck in the polo and cuff the jeans. Wear it well: Wear the complimentary color to the contrast tips on your shorts. Wear it well: Coordinate the contrast tips with your swimwear! It comes down to having a closet full of favorite pieces that you wear over and over again in a variety of ways. Most of his pieces are pretty basic, but one place he adds visual interest is in his collection of polo shirts. He’s stepped out more than once in a printed polo, be it stripes, sailboats, or even zebra. The simple yet polished style of a polo can translate from work to weekend, and the printed polo is no exception. Wear it well: Suit up a la Jeff Goldblum by skipping the shirt and tie in favor of something a little more fun, like a printed polo and statement shoes. Wear it well: Borrow Jeff Goldblum’s high contrast black and white blazer and trouser combo for you next lunch date. Wear it well: Play with color like Goldblum does here – dark green is practically a neutral. Wear it well: Channel both of these Jeff Goldblum looks with light denim, fun high tops and a colorful chino. 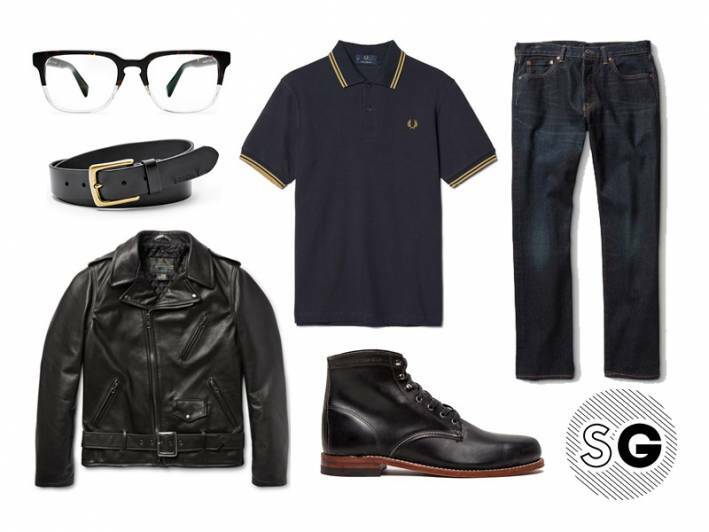 Wear it well: Modify this all black everything look from Goldblum with a pop of pattern under your jacket. A polo shirt should be worn closer to your body, so you’re not forced to tuck it in to your pants just to restrain the otherwise billowing material. Without extra fabric to worry about, the shirt should hit your pants right around the waistline, meaning it looks good tucked in or hanging loose. If you want to do the tuck/un-tuck thing so you can showcase your belt, we’ll allow it, with one caveat: your collar cannot be upturned. Those moves compounded would punt you into d-bag territory, and I don’t want that for you. Looking to get more mileage out of your favorite wardrobe staples? Check out “5 Days, 5 Ways” featuring the Breton shirt, navy crewneck sweater, and penny loafer.